1 Day Class 7:30a.m. – approx..5:00p.m. 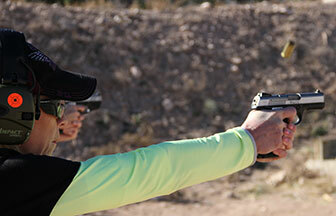 In a relaxed and fun environment, this 8-10 hr course introduces women to shooting handguns. This course is designed specifically for ladies with little or no practical shooting experience. You will learn basic firearm knowledge, shooting skills and most importantly the mindset and attitude necessary for owning and using a handgun safely. Actual in class practice time shooting using semi automatic air pistols preparing you for better marksmanship on the range. Loading and clearing a handgun. Students are provided complete handouts which summarize key points of the class. 5 plus hours of outdoor live-fire shooting drills with a full sized 9mm firearm. After class, you’ll have the opportunity to shoot various calibers of revolvers and semi automatic handguns to get the feel for the various sizes and types. These will be my personal firearms ..and I will furnish the ammo for these guns. Class size limited to 6 students. This allows me ( and my rangemaster/husband Marshal Halloway) to spend quality time and give attention to each student individually while on the range. Learn and acquire a different mindset and awareness level. Loading/unloading/dry fire and live fire. Have the opportunity to handle and shoot different calibers and types of firearms. If you don’t own one, or you don’t want to use your own, I have Ruger P95, 9mm’s to use. Included in this will be extra magazines, mag holders and speed loaders. The reason for using full size 9mm’s for training is~~~If you bring a small carry gun with you for training, you may certainly experience hand and arm fatigue at the end of the class due to the number of rounds fired with that caliber. ** Bring it with you, plus the ammunition for it. There will be time to work with it and shoot at the end of class. At least 300 rounds of 9mm “ball” ammunition. This is different than self defense ammunition. Safety glasses..unless you wear glasses, then no extra shooting glasses will be required. Bring a sack lunch, snacks and non alcoholic drinks of your choice, as we will not leave the building during lunch. Coffee and Tea will be provided in the class. Bottled water will be provided on the range. We will also take short breaks throughout the day..
Class Fee is $150.00… if using your own gun. Class fee is $175.00 if using mine. **Click on Registration tab at top of web page** Deadline for registration will be 3 days before day of class. You can call me personally to register for the class and discuss payment options at that time. Advance notice of 48 hrs will be needed to cancel for a full refund. If there is no notification of your intent to cancel or transfer/postpone from your registered class you will NOT receive a refund.